A pedestrian struck by a car is twice as likely to survive if the car speed is 20 mph instead of 30 mph. 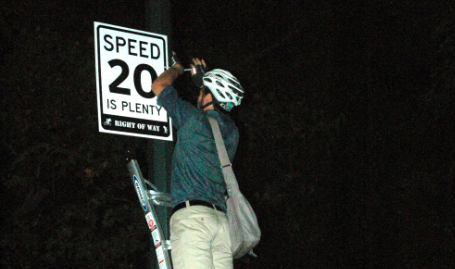 To increase traffic safety and combat speeding in residential areas, the DOT started in 2011 a Community based Neighborhood Slow Zone Program which includes a reduction of the speed from 30 mph to 20 mph with signage, gateway and speed bumps (see previous blog). The program was an immediate success and the DOT received so many applications that not all of them could be immediately accepted. Also some of those that were accepted were vetoed by community boards. Last week-end with the help of the Right of Way advocates, residents of 10 NYC communities who believed their applications have been unfairly rejected by the DOT or who have been waiting for more than 2 years for the city to implement the Slow Zone Program installed “20 is plenty” speed limit signs in Fort Greene, Clinton Hill, Prospect Heights, Park Slope, Greenpoint, Astoria, Jackson Heights, Jamaica, the Upper West Side, the Lower East Side, Tribeca and the West Village. As part of Vision Zero, Mayor de Blasio has called for a rapid expansion of the Neighborhood Slow Zone. The communities are calling on the mayor to stick to his promise.